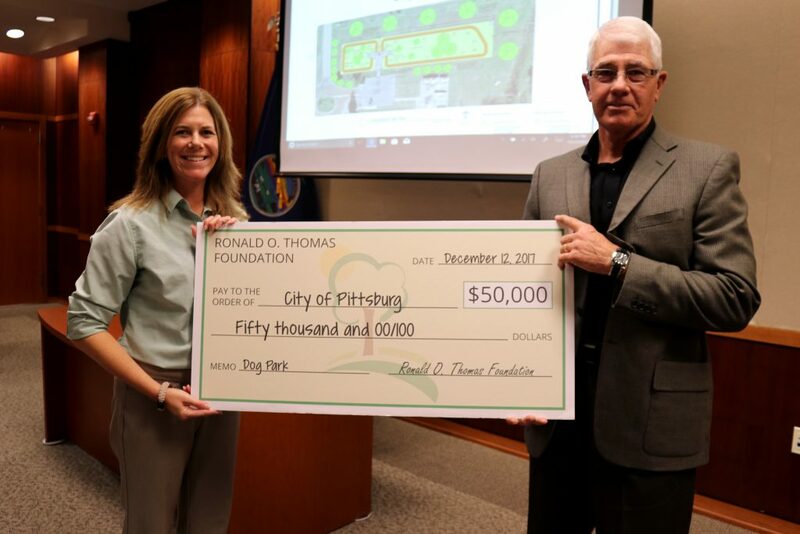 The creation of Pittsburg’s first dog park was made possible this week, thanks to a $50,000 gift from the Ronald O. Thomas Foundation. The City of Pittsburg received the generous donation Tuesday, December 12, during the City Commission meeting. The funds will establish a new pet play area in Schlanger Park. The dog park will be named in honor of the late Ronald O. Thomas, who, according to foundation trustee Jim Hoskins, had a soft spot for canines. City of Pittsburg Director of Parks & Recreation Kim Vogel says the Ronald O. Thomas Dog Park will benefit pets and pet parents alike. The fenced dog playground will offer more than 26,000 sq. ft. of play space and feature two separate areas for small and large dogs. The park will also include play equipment, such as ramps, tunnels and jump hoops. The dog park fits into the city’s Mid-City Renaissance project, which calls for additional recreation spaces. Aimed at revitalizing the center of town, the project will transform the 386-acre area just east of Pittsburg’s downtown district. The redevelopment plan includes the former Mission Clay site, Schlanger Park and surrounding neighborhoods. City Manager Daron Hall says community partnerships are essential to making the city’s vision for the Mid-City Renaissance District a reality. 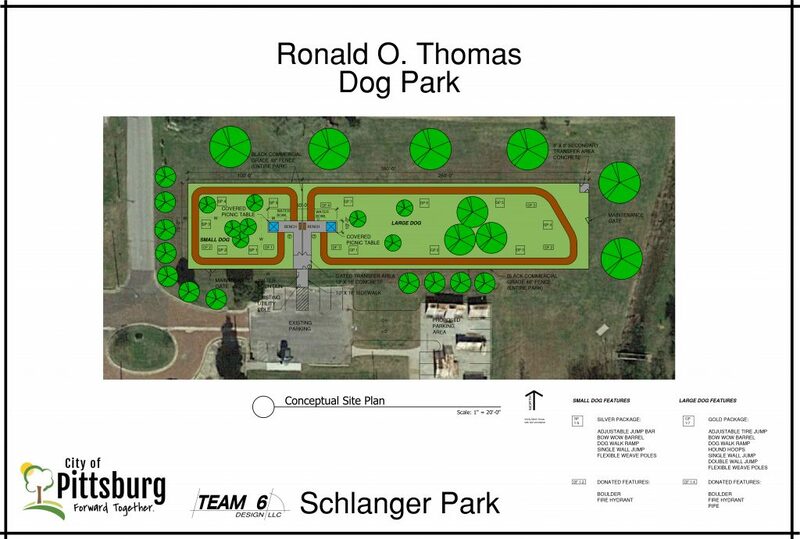 The dog park is one of many improvements to Schlanger Park scheduled for next year. Construction on new pickle ball courts and tennis courts are also underway. City crews will begin construction on the new dog park this winter and estimate the completion of the project in summer of 2018. Ronald O. Thomas was born in Kansas City, MO, and adopted by Lee and Pauline Thomas, of Baxter Springs, Kansas. After graduating from high school in Baxter Springs in 1949, Thomas attended and graduated from the University of Kansas School of Law in 1956. Working as an attorney in New York, he specialized in trademark law. Before his passing, Thomas established the Ronald O. Thomas Foundation to benefit charitable organizations in southeast Kansas and southwest Missouri.